The election continued the swing of working-class voters to the Conservative Party – but also the more important trend of working-class disengagement from politics. Can Labour respond without succumbing to populism? The general election was peculiar for a large number of reasons. One of those reasons, relatively overlooked to date, is that – amid some stunning victories in affluent areas like Canterbury, Reading East, Warwick and Leamington, and Sheffield Hallam – the Labour Party lost the constituency of Mansfield, a predominantly working-class town in Nottinghamshire. This longer post will focus on the deepening problem of working-class political disengagement. As someone from a traditional working-class background, the general election has brought to national prominence a set of issues that – although I have rarely written about them – are central to my lived experience of British politics. This experience undoubtedly colours the analysis presented below, but in a way that, I hope, illuminates more than it obscures. Although I have never been anything other than acutely conscious of my class background, the topic of class-based inequalities has played a remarkably small part in my professional life, despite a career that has taken in stints as a government and trade union official, as well as academia. Ironically, it has taken an apparent ‘surge’ of electoral support for the most left-wing Labour leader of my lifetime to force me to seriously question my view that Labour enjoyed the support of most working class voters (albeit perhaps begrudging support) and that working-class conservatism, although ever-present, would only ever be a minority pursuit. It has of course been obvious for a long time that this political imaginary is anachronistic; indeed, my own research interests in intergenerational and geographical inequalities reflect other faultlines in the politics of inequality which are now severely fractured. Class-centred views of capitalism obscure as much as they illuminate (I also think gender inequalities are as important as class inequalities, although they feature even less in my research). However, until the 2017 election, there appeared to be no compelling reason to confront my class-centred view of party politics. This post will re-examine how the working class voted (or not) at the general election in historical context, before examining the main ways in which the Conservative Party and Labour appear to be responding to, and indeed reinforcing, the trends identified. I argue that Labour’s defeat in Mansfield is a microcosm a wider issues around the working-class vote – it raises problems that both parties now have to grapple with. The post asks whether either party can pass ‘the Mansfield test’ which, I believe, will be key to securing a majority at the next election. But, crucially, the test asks different things of the Conservatives and Labour. I also argue that the proletariat problem is highly relevant to the apparent rise of populism in the UK – but for reasons that are not currently well understood. Before the 2017 election, Labour had held Mansfield for 95 years (and it was actually first won by the party in 1918 – one of a clutch of new seats as the party won more than 50 constituencies for the first time). This is of course not to suggest that Jeremy Corbyn’s leadership is solely or even principally to blame for this particular loss. But there is no doubt that the Corbyn surge has changed the complexion of Labour’s electoral base. Paula Surridge’s constituency-by-constituency analysis of the 2017 results– using routine and semi-routine occupational grades to define the working class – demonstrates that a higher proportion of working class residents is strongly correlated with a swing to the Conservatives, and a swing away from Labour. This is of course partly related to support for Brexit. Labour slightly increased its share of the vote in constituencies with a higher proportion of ‘leave’ voters, but its vote increased by a much wider margin in ‘remain’ constituencies (despite Labour’s manifesto signalling support for the government’s approach to Brexit). Interestingly, areas with a high Labour vote share in 2015 and high leave vote in 2016 delivered higher Labour-to-Conservative swings in 2017. Is the loss of Mansfield therefore explained by attitudes to the EU? Only partially. Mansfield’s support for leaving the EU was 70 per cent. But this archetypal ‘left behind’ town has been moving away from Labour for a very long time. Its directly-elected mayoralty has been held by ‘independent’ candidates since the post’s creation in 2002. The Mansfield Independent Forum – a centre-right grouping in all but name – is now the council’s largest party too, forming a cabinet with the support of UKIP councillors. The Conservatives have also, generally speaking, been catching up to Labour at general elections since 1997. So, Mansfield was a fairly marginal seat by the time Theresa May called the election. It is probably fair to say that the town’s support for Brexit had finally made the seat winnable for the Conservatives, but the reason that it had already begun to abandon Labour – and indeed voted for Brexit – is surely wrapped up in the fact that the constituency has one of the highest concentrations of working-class voters in England. 60 per cent of the residents of the local authority area (coterminous to the constituency) are categorised as social grades C2 (skilled manual workers) or DE (semi-skilled, unskilled and unemployed), compared to an average of 46 per cent. The loss of Mansfield is part of a long run national trend of working class voters deserting the Labour Party. IpsosMori voting data shows C2 support steadily declining from around 50 per cent in 1997 to 30 per cent in 2010, and DE support declining from around 60 per cent to around 40 per cent over the same period. Working class support for Labour recovered slightly between 2010 and 2015, before reaching the lowest level ever recorded (albeit in opinion surveys rather than voting surveys) in early 2017. The trend for the Conservative Party’s working-class support is almost the mirror image. After declining from around 40 per cent among C2 voters and 30 per cent among DE voters in 1992, by 2017 the party’s working-class support had risen above this level – almost to the height of its early 1980s peak. Labour’s support among the working class recovered in time for 8th June to a level above that recorded at the 2015 election, allowing many other Labour ‘heartland’ seats to be spared. At the same time, however, as the table below shows, working-class support for the Conservatives surged even more strongly. As such, the Conservative Party now leads Labour among C2 voters by 4 percentage points, rising from an even share with Labour in 2015 (C2 voters are over-represented in the marginal seats Labour must target to secure a majority). And the Conservative Party has closed the gap among DE voters to 9 percentage points, having been 15 points behind in 2015. The numbers clearly signal that it was not one-way traffic: Labour picked up working-class vote share too, albeit by far less than the Conservatives (it is worth noting also that Labour’s vote share in Mansfield increased between 2015 and 2017 from 39 to 45 per cent, albeit by far less than the Conservative Party, which increased its vote share from 28 to 47 per cent). Alongside the striking working-class surge for the Conservatives, the most remarkable figures in the table are those for Labour’s support among the AB and C1 groups of managerial and professional workers. Incredibly, the spread of support by class is now fairly even for both main parties. With both parties increasing their working-class vote share, we can assume that relatively few voters switched between the two parties. 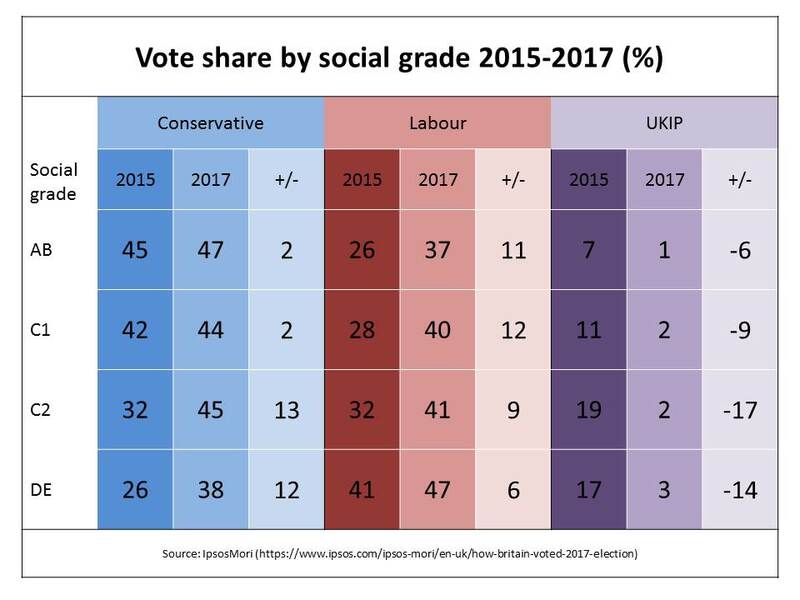 As the above table demonstrates, the working-class UKIP vote collapsed; Labour took a slice of this vote, but it went mainly to the Conservatives. But data from YouGov shows that working-class support for other parties such as the Greens and the Scottish National Party also fell substantially between the 2015 and 2017 elections – we can assume the bulk of this went to Labour. The Labour vote was also particularly strong among young C2 and DE voters. Labour won 62 per cent of the vote share among C2 voters aged 18-34 (compared to 27 per cent for the Conservatives), and 70 per cent for of the DE vote in the same age group (compared to 18 per cent for the Conservatives). Understandably, this has been the cause of much celebration among Corbyn supporters. There is, however, a rather inconvenient truth which overrides this positive (or not-quite-as-bad-as-it-seems) story about Labour’s working-class vote in 2017: turnout among working-class voters remains very low. While rising slightly, as it did across the electorate in general, C2 turnout was only 60 per cent in 2017, and DE turnout was only 53 per cent (the overall figure was 63 per cent, while AB and C1 voters both have a turnout rate close to 70 per cent). DE turnout had been 57 per cent as recently as the 2010 election. In 1997, it had been 66 per cent (albeit on a relatively high overall turnout). There is the additional problem for Labour’s positive gloss on the young DE vote that the E category also includes most students (assuming they did not have an occupational group before entering higher education). 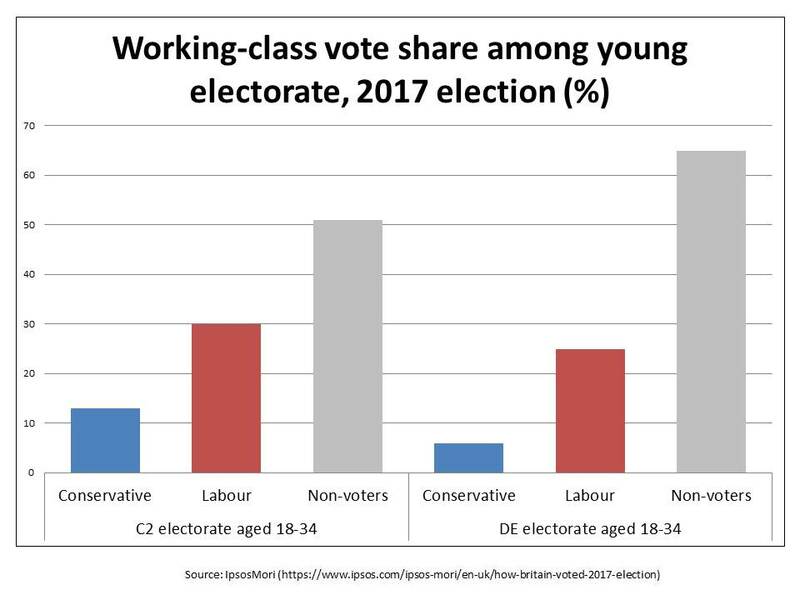 As such, even the 35 per cent turnout rate for young DE voters is likely to significantly over-estimate turnout among working-class young people, given the significant under-representation of working-class people in the student population (although the number of students from disadvantaged backgrounds is increasing, despite higher tuition fees). The persistence of low turnout at the 2017 election is the only story worth telling about the working-class vote in the UK at the moment. But there may be other stories developing. It is possible that the Conservatives are genuinely emerging as a party of the working class, as Labour increases its appeal to more affluent groups. Labour would of course retort that the Corbyn surge, while too late to enable an electoral victory, was genuine, and encompassed working-class as well as middle-class voters. It could also argue, rightly, that the working class is now increasingly fragmented – by geography, age and indeed the nature of lower-skilled employment – and that the party is appealing to some working-class groups more than others. It is possible to believe that both of these sub-plots might materialise to some extent. The point is that, at the moment, neither is compelling. Working-class voters remain disproportionately disengaged from formal politics, especially among young people. It is difficult to believe that, over the long run, this is anything other than negative for Labour. The cause is by no means hopeless, but you would not choose to start from here. The Conservative Party has a defeated leader, but does it have a winning strategy? The Conservative Party is highly unlikely to repeat the calamitous campaign it ran at the general election – and will almost certainly choose a new leader before another election is held – but the notion that it can easily reclaim the handful of additional seats required to secure a parliamentary majority rests on some rather shaky assumptions. Many of the seats lost by the Conservatives are rightly considered to belong to the party’s heartlands. But it is no longer clear that they can be recovered while the party remains committed to delivering Brexit, especially if overall youth turnout remains at 2017’s relatively high level (although greater awareness of Labour’s pro-Brexit stance may alter this dynamic). A new Conservative leader may soften the party’s position on Brexit, and indeed may dip into the Osbornomics playbook by producing a housing market stimulus to attract middle-class urban dwellers back to the party – counteracting Labour’s popular proposal to abolish university tuition fees. A housing market stimulus that meaningfully benefits younger as well as older groups would be expensive, but politically possible. The salience of ‘the deficit’ as a decisive electoral issue has declined, and indeed the Conservatives have to date been rather successful in designing housing market stimuli that are ideologically compatible with austerity politics. The problem, however, is that both policy moves would in all likelihood jeopardise the progress the Conservative Party has made in working-class areas. One of Theresa May’s innovations as a Conservative strategist was to essentially abandon David Cameron and particularly George Osborne’s attempt to appeal to affluent groups in large provincial cities. The resilience of the Labour vote in most large cities at the 2017 election demonstrates the fallacious nature of the Osborne strategy (Sheffield was in fact the only city in England and Wales which delivered a swing to the Conservatives at the election). Of course, Osborne would have been the first to point out that the Conservatives’ strategy under Cameron between 2005 and 2016 would not have been possible if the Conservatives were to become a pro-Brexit party. Nevertheless, May’s alternative emphasis on smaller cities and towns was starting to bear fruit. Ironically, the metro-mayoral offices – the creation of which was central to Osborne’s metropolitan strategy – in the West Midlands and West of England were only won by the Conservatives because of support attracted by the party outside the regions’ core cities. None of this is to suggest that May’s approach is the correct one since, clearly, the election result was disastrous for the party. But if a new leader can find a middle-ground between Mayism and Osbornomics, the class alliance underpinning the Conservative statecraft emerging under Theresa May might start to look a little more robust – and low turnout among working-class voters would in these circumstances continue to benefit the party. The perceived imperative of delivering Brexit, however, might be the undoing of this potentially rosy picture, even if the same issue also begins to curtail Labour’s revival. There is nothing wrong with Labour attracting more middle-class votes. At the most basic level, it is the key reason that the vast majority of the Conservatives’ 2017 manifesto will never be implemented. Moreover, it is clear that Labour needs to forge alliances across socio-economic groups to win a majority in Parliament. But Labour has not succeeded in doing that yet. Celebrating the achievement of gaining 30 seats must at some point give way to consideration of how a further 64 seats will be gained to secure a parliamentary majority. And Labour’s recent local election performances have been abysmal: the party lost almost half of the councils it controlled at the May 2017 local elections. This is highly relevant for the present discussion, given that working-class people in places like Mansfield and, as we learned recently in the most tragic circumstances, Kensington (a constituency which Labour won in the general election) rely on local services far more than middle-class people. It is also unknown – and probably unknowable – whether Labour’s success in retaining the vast majority of its predominantly working-class seats in 2017 was attributable to the Corbyn surge, or indeed a Labour-despite-Corbyn vote. Of course, both explanations are true to some extent, but the resilience of this compromise within the party’s working-class base will be tested now that Corbyn is within sight of Downing Street. At the same time, we do not know whether this success was a Labour-despite-remain vote – working-class voters supporting Labour habitually, but not fully trusting the party to deliver Brexit – which would also be tested if Labour were to replace Corbyn with a leader unambiguously opposed to Brexit. Labour’s next move, however, cannot be determined solely by electoral considerations. While the Conservatives’ ‘Mansfield test’ is primarily a political one, Labour’s test is more existential. Labour might now be able to win without the strong working-class support it has traditionally secured, but could it govern? Can a Labour government avoid being constrained in office by an increasingly middle-class base? As I have written about previously the party’s highly regressive manifesto commitments on fiscal policy, contrasted with its approach to higher education funding, offer an alarming glimpse in this regard. However, the broader charge of ‘embourgeoisement’, made most forcefully by John Gray, overlooks that working- and middle-class interests may be in far stronger alignment during a period of labour market ‘hollowing out’ than is normally assumed. While Corbyn himself had no significant track record, before 2015, of raising concern about the implications of this, the left-liberal softer Corbynites that sustain his leadership have successfully tapped into an apparent ‘proletarianisation’ of middle-class experiences of the labour market to broaden the party’s activist base. But economic precariousness is, overwhelmingly, an affliction of the traditional working class. The over-amplification of middle-class precariousness among Corbynites points us towards another inconvenient truth that, with some notable exceptions, Labour has become noticeably unrepresentative of the working class. The repeated refusal to acknowledge very low C2DE electoral turnout is testament to this. Furthermore, on a personal note, it is incredibly disappointing to see leading lights of the Labour left argue, sometimes implicitly but often explicitly, that their relatively privileged backgrounds gives them a greater appreciation of working-class disadvantage. This is a perspective drenched in pandering (albeit entirely well-meaning, I think) – evidenced by the seemingly ubiquitous view among soft Corbynites that Corbyn is correct to support Brexit now, to appease working-class Brexiters, so long as it is reversed as and when the foolishness of Brexit becomes more apparent among the working class. Recognising working-class support for Brexit is fine, but a strategy based on the assumption it can be manipulated is most definitely not. As such, this is also a perspective just a few short steps away from blaming the working class for their own failure to embrace socialism in sufficient numbers. What happens if working-class support for Brexit increases rather than declines? Those softer Corbynites more willing to acknowledge working-class opposition to Corbynism generally uphold a pseudo-Marxist false consciousness thesis whereby the working class are deemed incapable of understanding their own socio-economic interests. In practice, the experience of capitalism by working class groups has always been heavily politicised, but manifests as an interest in both liberation from and reproduction of their class status. For working-class people, this contradiction is not a theoretical problematique, but rather a crushing, everyday dilemma. The tendency of Corbynites to marginalise the agency of the working class in articulating their own interests is therefore a worrying one. It is a sentiment which also, paradoxically, demands the ‘democratisation’ of the Labour Party, presumably so that its predominantly middle-class and largely London-based membership can deny local party members in working-class constituencies with far fewer members, like Mansfield, the freedom to choose their own representatives. One of the corollaries of this sentiment is a predilection to portray the present moment as a historical juncture, that is, an interregnum between distinct historical periods. Jeremy Gilbert’s portrayal of contemporary circumstances as ‘the end of the long 90s’ is the most notable example. It provides a comforting frame for Corbynism, since it compels an immediate mobilisation of socialist forces, irrespective of working-class support, in order to capitalise upon a weakening of neoliberal normativity. History does indeed develop via junctures at which a multitude of futures are imaginable, and there is much to commend in Gilbert’s writing. But the notion that we can identify a juncture as we live through it, immediately understanding its historical implications and imperatives for praxis, is a self-serving delusion, and a crude distortion of the Gramscian and Polanyian theory that this perspective is loosely based on. Away from the Corbynite majority, the only serious thinking about the proletariat problem within the Labour Party in the last few years has come from the Blue Labour perspective. Alas, ‘serious’ is by no means synonymous with ‘sensible’ in this context. Blue Labour replaces the class politics of inequality with the class politics of culture, apotheosing the image of the white, English manual worker as the key agent of the socialist imaginary, while depriving this agent of their experience of exploitative economic relations and instead fetishising their experience of place and ‘belonging’. Corbynism and Blue Labour offer very different perspectives on Labour’s relationship with the working class, but ultimately both are products of the absence of working-class voices within the party. While I was writing this post, Jeremy Corbyn’s appearance on the main stage at Glastonbury induced a confrontation between these perspectives. Corbyn’s speech (which included a line from Shelley: ‘Rise like lions after slumber, in unvanquishable number, shake your chains to earth like dew, which in sleep had fallen on you – ye are many, they are few’) sparked an inevitable outbreak of mockery and incredulity about its utility, given the perception that the cost of attending is prohibitive to working-class people. Just as inevitably, Corbyn supporters responded with accusations of snobbery, often pointing out that many working-class people ‘save up’ the cost of attendance, or indeed attend for free as volunteer bar workers. I did indeed do both of these things, when I was poor, in order to be able to afford concert and festival tickets (and would recommend Mark Brown’s inspirational verdict on this debate). Yet it is undeniably the case that while many working-class people of course attend predominantly middle-class gatherings such as Glastonbury, most do not and never will. Many are simply unable to access such cultural goods, due to financial pressures and/or caring responsibilities. Some of those unable to attend would quite like to go to Glastonbury, and some, frankly, could not give a toss. There are as many working-class lifestyles as there are working-class people. Of course, the class politics of Glastonbury is small beer. The broader issue is that Labour seems trapped between two equally absurd positions on its working class base; either that the working class is a homogenous, apolitical lump for which Labour must craft a distinctive offer, or that there are increasingly few differences between middle- and working-class politics. If Labour continues to neglect the need to compete with the right for working-class votes – a strategy which can only be achieved by listening to voters – then working-class disengagement is only liken to worsen. Sadly, the persistence of working-class disengagement, despite the Corbyn surge, is not something many in the Labour Party are yet prepared to acknowledge. This would be a dangerous oversight: the right benefits from working-class disengagement, and indeed Conservative statecraft relies upon it insofar as it makes many constituencies with sizeable working-class populations much more winnable. As such, we should view the Conservative Party’s apparent appeal to the working class support not simply as an attempt to redefine their electoral base, but rather as an attempt to co-opt a populist response to the flaws in their own developmental model. The notion, frequently voiced on the left, that Theresa May’s leadership represents the ‘Ukipification’ of the Conservative Party is too simplistic. The first-past-the-post system means the Conservative Party does not need to win all of working-class seats competed over by Labour and UKIP at, for instance, the 2015 election: it simply needs to nullify the appeal of both parties to make its own seats less vulnerable. Redefining working-class politics through populist sentiment is part of this task. It did not work in June – perhaps because May is the wrong leader for the job – but Labour cannot assume that it will not be successful in the future. Brexit is the key to Conservative populism now. The government’s position is understandably attracting derision, but the longer the Brexit process takes – undermining the British state’s ability to actually address problems faced by working-class people – the greater the opportunities will be for a canny centre-right leader to present further British parochialism as the solution to, rather than the cause of, the wicked problem of leaving the EU. Cameron and Osborne may have opposed Brexit (as did May), and, as I argued above, the process of delivering Brexit may yet lead to the unravelling of the Conservatives’ governing project. But the idea of Brexit may in fact have saved conservatism from its own contradictions. To reiterate, the party was already winning more working-class support; the austerity narrative has more populist allusions than we tend to realise, and helped to lay the intellectual groundwork for working-class support for Brexit. Worryingly, the populist turn is not evident solely on the right. The great genius of Jeremy Corbyn and his chief lieutenant John McDonnell is their insight that, contrasting sharply with the instincts of most of their supporters, working-class voters are never going to be won to the socialist cause through Guardian op-eds, music festival speeches or even the community activism of organisations such as Momentum. In this regard, Jeremy Corbyn is no Corbynite. As such, Corbyn and McDonnell increasingly draw on populism to win support, and seem as comfortable as centre-right leaders in doing so. Brexit, again, is an obvious example: Corbyn’s Euroscepticism was born in the Bennite tradition, but his Brexit position has, like May’s, absorbed a populist twinge, as demonstrated by his willingness to sacrifice his lifelong support for a very liberal immigration policy and commit Labour to ending freedom of movement. This is something which too many Labour members are overlooking at present. Brexit is not simply a holding position for Corbyn and McDonnell. Despite the Labour manifesto offering Parliament a ‘truly meaningful vote’ on ‘the final Brexit deal’, it is clear that the Labour leadership considers the Brexit issue ‘settled’. Labour under Corbyn may push for a Brexit deal that somehow prioritises ‘jobs and living standards’, but will ultimately support whatever deal the Conservative government come home with. More generally, as demonstrated in Matt Bolton’s recent blog post for SPERI, Corbyn and McDonnell have begun to adopt an increasingly populist and conspiratorial tone on the economy, offering a ‘personalised’ critique of global elites for creating a ‘rigged’ economy. It is not clear yet whether Corbyn’s middle-class supporters are concerned about such rhetoric or whether, in their detachment from working-class politics, they simply have few alternative means by which to communicate with Labour’s traditional base. This is not to suggest that there is an easy path away from populism for Corbyn’s Labour. We can see his populist turn as, in some ways, a valiant attempt to prevent the abandonment of the working-class vote to the right. It might be the best answer he has to the Mansfield test, albeit one obscured by a more electorally significant surge of middle-class support (to reiterate, Labour’s working-class vote share has recovered in the last few months). But if this populist turn in British politics is, fundamentally, a product of the persistence of working-class political disengagement, in the long run this will surely only benefit the right. Genuine working-class engagement is the antidote – but this is easier said than done.